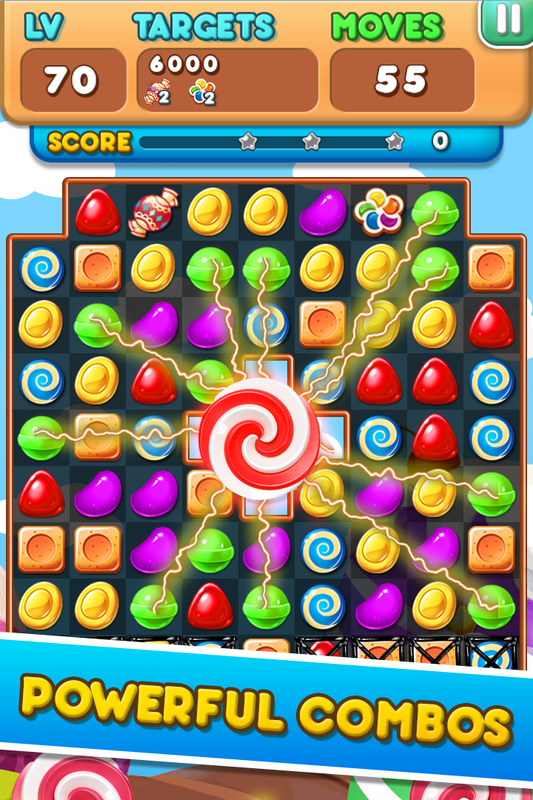 Amazing and colorful great new match 3 puzzle game Candy Sweet Frenzy Boring with another puzzle, you should make an adventure in candy sweet frenzy game. 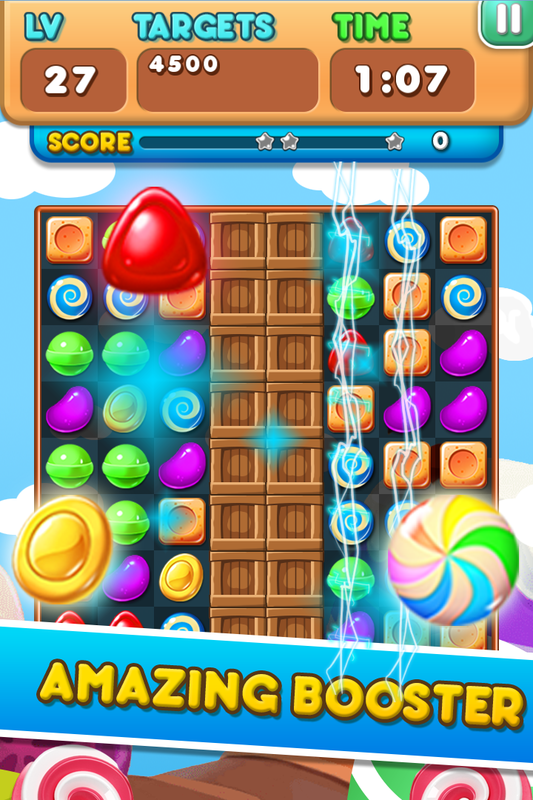 In this saga world, you can be challenge by a frenzy quest, deluxe mission, find and connect many colorful candies. A mystery saga world is waiting for your journey. Gameplay still keep simple like the old diamond puzzle game like gem mania, candy mania, fruit mania or the other simple match three puzzle. Basic idea is connect three or more same color diamond in a line or column to destroy them and get score. But we design mission more and more challenge for you to discover via your journey, in some mission afterwards, instead of getting score, use must collect some food, ingredients to pass a level. And when you hard to find any candy to match color, after five seconds, a glowing candies will point it for you. We designed this for easier than and keep you don't spend much time to find matching color. HOW TO PLAY: â˜… Match 3 or more jelly to make score. â˜… Complete the target of every stage to pass a quest. â˜… Don't let time pass by so fast, it will make you angry when can't pass some difficult mission FEATURES: â˜… Match 4 jellies can create a bomb or lighting. â˜… Match 5 jellies can create a new specific sweet jelly can destroy the same color. â˜… More than 130 level with many various mission. â˜… The jelly bomb can eliminate the jewels around. â˜… The lighting jelly can destroy a line or a row. â˜… Many Deluxe jelly make some frenzy quest more challenge. â˜… Complete your adventure to the end of saga world. In your adventure journey to the end of saga world, you can be stuck at some quest by not enough time or can't be completed target of mission, but don't be discouraged, continue and try passing all level to become a Winner of this challenge puzzle game. If you gave any feedback or any problem when playing this candy sweet frenzy, please don't hesitate to contact us via email minhly278@gmail.com Thank you very much ! !